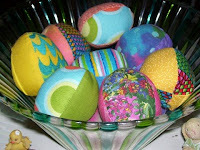 I am stitching up some fabric eggs from scraps. I've been hanging on to some small brightly colored and patterned scraps hoping to find a project for them. 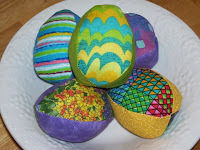 This egg pattern from retro mama is the perfect use. The only difference I've made to it is that, once sewn and prior to turning, I neatly squash the bottom point flat and sew directly across it. This is a trick I learned from sewing juggling balls which need some reinforced ends. Perhaps it warrants a photo. I'll take one when I finish sewing the dozen eggs I'm making later today.